Yale scientists have identified a possible neurobiological home for the spiritual experience—the sense of connection to something greater than oneself. Activity in the parietal cortex, an area of the brain involved in awareness of self and others as well as attention processing, seems to be a common element among individuals who have experienced a variety of spiritual experiences, according to a study published online May 29 in the journal Cerebral Cortex. "Spiritual experiences are robust states that may have profound impacts on people's lives," said Marc Potenza, professor of psychiatry, of the Yale Child Study Center, and of neuroscience. "Understanding the neural bases of spiritual experiences may help us better understand their roles in resilience and recovery from mental health and addictive disorders." Spiritual experiences can be religious in nature or not, such as feeling of oneness in nature or the absence of self during sporting events. 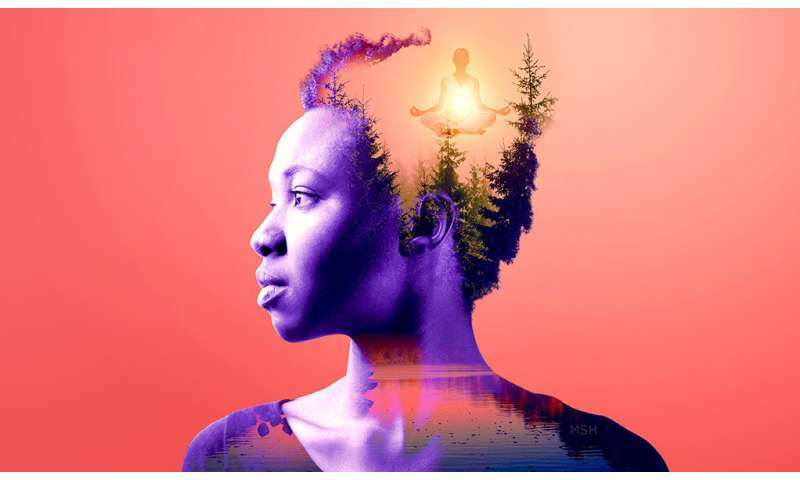 Researchers at Yale and the Spirituality Mind Body Institute at Columbia University interviewed 27 young adults to gather information about past stressful and relaxing experiences as well as their spiritual experiences. The subjects then underwent fMRI scans while listening for the first time to recordings based on their personalized experiences. While individual spiritual experiences differed, researchers noted similar patterns of activity in the parietal cortex as the subjects imagined experiencing the events in the recordings. Potenza stressed other brain areas are probably also involved in formation of spiritual experiences. The method can help future researchers study spiritual experience and its impact on mental health, he said. I had a spiritual experience where I was awakened around 3:30 am, heard voices for me to take a shower so that the water would act as a conduit. As soon as my forehead had water impact, I saw prism colors entering through my right parietal lobe at a 45 degree angle, and felt my brain shift and then fuse and then getting data that did not make sense. I was very much worried but informed through voices that I should not be afraid of the event. I made a video about my experiences but can't post because of the spam filter. NB: Daytime shower-urgings are a different matter entirely; pay much—if not more—heed, to those. Well said: "study spiritual experience and its impact on mental health". If you have spiritual experiences, it is likely a mental health issue.